After 20 years out of production, Toyota is resurrecting the Supra, the sporty two-door hatch that traces its DNA back to the Celica, but also shares a more than 50-year lineage with unique Toyota sports and GT cars. 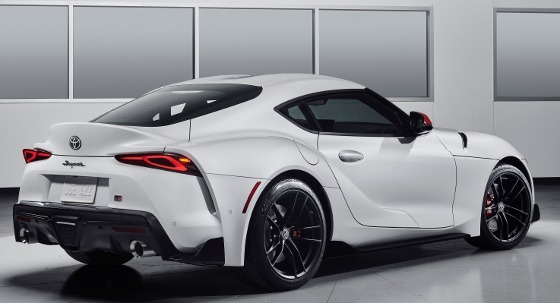 This fifth-generation GR Supra is a fully forward-looking sports car, brimming with a cutting-edge powertrain, chassis, and multimedia technology. The 2020 Supra goes on sale this summer and will be available in two grades: 3.0 and 3.0 Premium. A special Launch Edition, based on the 3.0 Premium grade, is also available (more on that later). 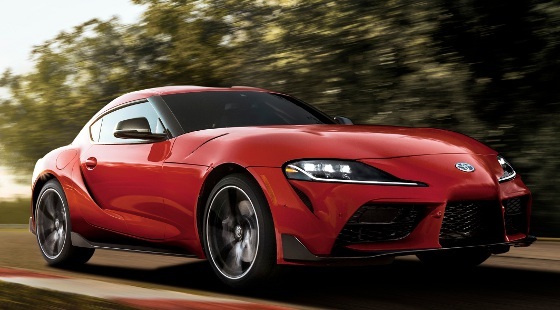 Prices for the 2020 Toyota GR Supra start at $49,990. 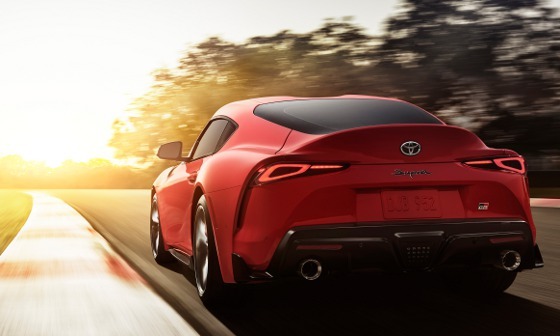 Drivers can look forward to an exhilarating blend of power, precision, and agility thanks to a rear-wheel drive design that honors Toyota sports car heritage with its low center of gravity and optimal weight balance. There is a strong connection to Toyota's 1967 2000 GT and 1993-2002 Supra in both design and mechanical configuration. 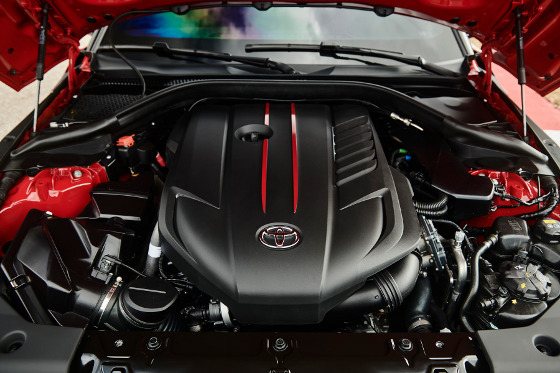 Like the pinnacle of the previous Supra series, the 2020 model is powered by a turbocharged inline six-cylinder engine. The new Supra's 3.0-liter twin-scroll turbo six produces 335 hp and 365 lb-ft of torque and is teamed with a quick-shifting 8-speed automatic transmission with paddle shifters. Toyota projects 0-60 mph acceleration in 4.1 seconds, which makes this the quickest Toyota-branded production vehicle to date. 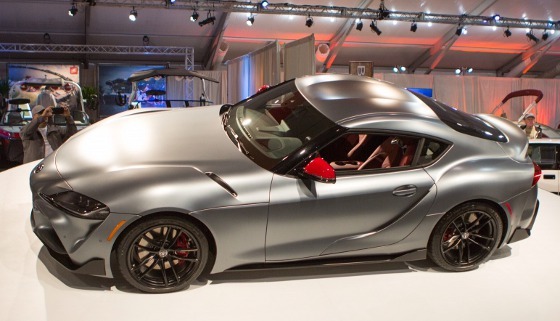 Toyota offered a glimpse of the new Supra's design theme in 2014 with the dramatic FT-1 concept car that emerged from Toyota's Calty design center in California. 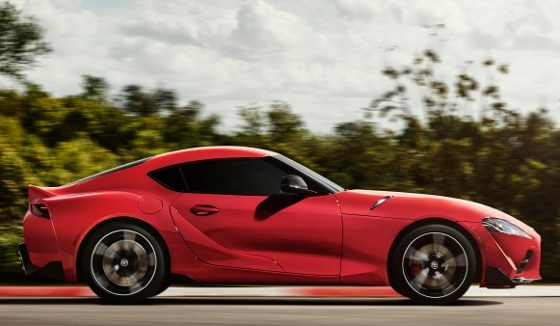 Supra's striking exterior design was inspired by the FT-1's expressive form. 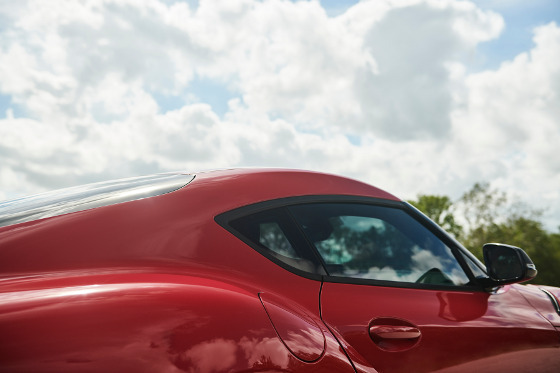 Optimization of the FT-1 design onto the efficient, high-performance packaging of Supra was achieved by condensing the forms, reducing unnecessary elements, and further enhancing the dynamic and powerful character. It focuses on core Supra attributes, such as its inline six-cylinder engine and rear-drive layout, while enhancing other features, such as stretching the hood to highlight the engine and creating a taut, but spacious, two-seat cabin that helps accentuate an ultra-wide stance. The result is a look unique to Supra (internally referred to as "Condensed Extreme"). 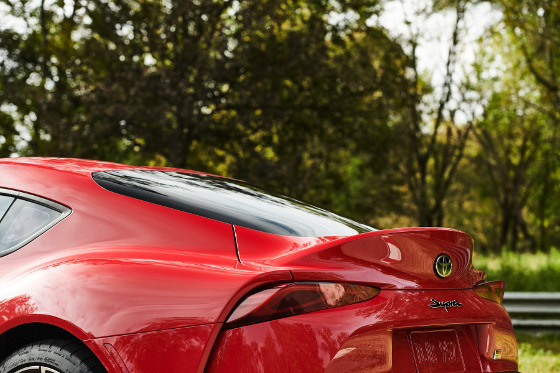 The Supra design delivers a 50:50 weight balance while optimizing front-to-rear aerodynamic balance. Toyota sports car heritage is evident throughout. The double-bubble roof design, for example, recalls the Toyota 2000 GT. It reduces drag by shaving the roof center to reduce the projected frontal area without sacrificing occupant headroom. Expressive colors accentuate the emotional connection drivers feel with a high-performance sports car, which is why the 2020 Supra's paint palette includes bold Renaissance Red 2.0, Nitro Yellow, and Downshift Blue. The available Phantom Matte Gray adds a sense of drama to the Supra's tautly curved surfaces by combining a matte finish and a hint of blue to create a metal-like texture. Other available colors include Absolute Zero White, Tungsten Silver, Turbulence Gray, and Nocturnal Black. The display's easy-to-read layout puts multimedia information, including audio and available navigation, on the right side. An available full-color Head-Up Display projects vital driving and navigation information ahead of the driver. Toyota designers took a fresh approach to designing the center console, giving it an asymmetrical shape that tightly envelops the driver, with a padded pillar that serves as a right leg bolster. The passenger's side of the console, meanwhile, is open for a roomy feel, yet also features kneepads for bolstering in corners. Supra's smartly trimmed luggage area, accessed via a lightweight composite hatch, offers capacity for two people to pack for a weekend getaway. The compartment is shaped to accommodate long items, such as a track-day toolkit. 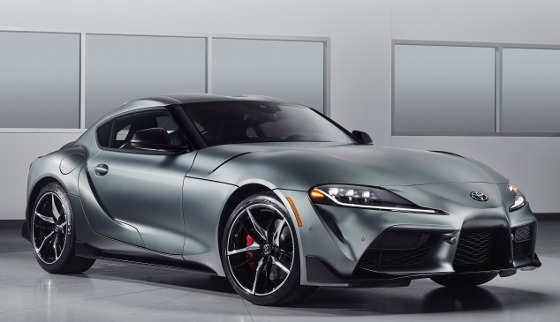 As mentioned, the 2020 Supra features a 3.0-liter turbocharged inline six that will produce 335 hp and 365 lb-ft of torque. The torque comes on strong from very low engine speeds, thanks to a combination of a twin-scroll turbocharger, direct fuel injection, and continuously variable timing on both the intake and exhaust camshafts. Engine response is further enhanced thanks to the inline six's variable intake valve lift system that adjusts intake valve timing and duration. The 8-speed automatic transmission delivers quick up- and downshifts and features paddle shifters for manual control when desired. Short ratios for the lower gears and a Launch Control function enable powerful acceleration with maximum traction. Top track speed will be electronically limited to 155 mph. The 2020 Supra will offer two driving modes: Normal and Sport. Sport Mode provides track-driving capability by reducing intervention of the traction and stability control functions as well as sharpening throttle response, increasing steering weight, improving transmission shift crispness, more aggressive active differential tuning, and amplifying exhaust sound. For performance driving enthusiasts, the Supra will have an active differential that uses an electric motor and multi-plate clutches to control lateral torque. The active differential precisely controls torque distribution between the rear wheels, with stepless variable locking from 0 to 100 percent. The differential can control torque distribution between the rear wheels when cornering under both acceleration and braking, enabling greater momentum through a corner. The active differential is also effective at ensuring neutral handling by reducing both understeer and oversteer. Toyota GAZOO Racing had a specific vision when developing Supra. High structural rigidity, a low center of gravity, and 50:50 weight distribution were paramount to Toyota's goal of achieving neutral cornering balance. For example, Toyota identified nine areas of the vehicle's rear structure to be reinforced to increase rigidity. Toyota also specified spring and shock absorber tuning for the new double-joint spring strut front suspension and multi-link rear suspension. 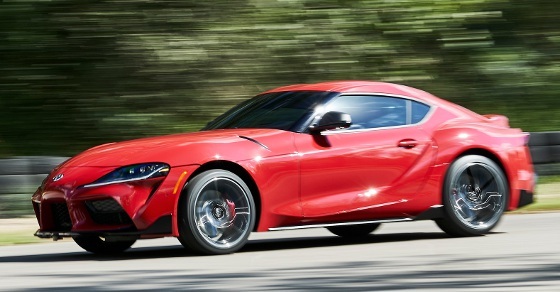 Likewise, Toyota set specific parameters for the Supra's stability control system performance. The multi-link rear suspension with a five-arm construction consists of lightweight aluminum to reduce weight, while steel is employed in key areas for added strength and durability. The rigid rear subframe, and the bracing that connects it to the body structure, helps ensure extremely precise wheel control. Supra comes standard with 19-in. forged alloy wheels. The rear wheels and tires are wider than on the front (rear tires: 275/35R19; front tires: 255/35R19) to enhance grip, and performance Michelin Pilot Super Sport tires are fitted. Brakes are large at all four corners, highlighted by 13.7-in. front rotors held by 4-piston Brembo calipers. Standard on all Supras is Adaptive Variable Suspension, which instantly adjusts damping force in response to driver input and road conditions. Two settings for the suspension are available: Normal and Sport. Like its 1990s predecessor, the 2020 Supra is equipped as a premium GT, with a deft balance of function and premium comfort and convenience features. Keyless Smart Entry, dual automatic climate control, auto-dimming rearview mirrors, rear camera, rain-sensor windshield wipers, garage door opener, power folding mirrors, and a leather-wrapped steering wheel are standard. Standard active safety features include forward collision warning, automatic emergency braking with pedestrian detection, lane departure warning with steering assist, automatic high beam, and road sign assist. Additional active safety and convenience features available are adaptive full-speed cruise control, blind spot monitor, rear cross-traffic alert, and rear-end collision warning. The new-generation Supra delivers a state-of-the-art multimedia and connectivity experience. The 3.0 grade features a 6.5-in. display that can be operated by the rotary controller on the console, as well as Bluetooth and iPod capability. The 3.0 Premium grade gets an 8.8-in. touchscreen display with navigation, rotary touch controller, Supra Connect telematics services, wireless Apple CarPlay, a premium 12-speaker JBL audio system, and wireless phone charging. The JBL audio system and navigation are available options on the 3.0 grade. Remember we mentioned that special Launch Edition? 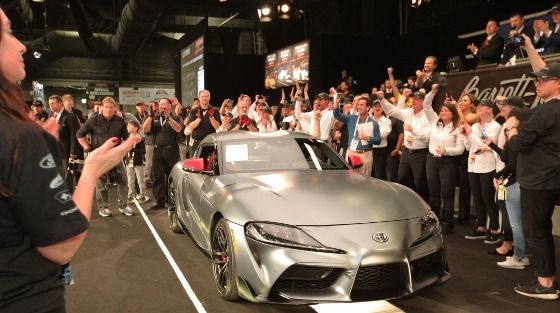 The first production 2020 Toyota GR Supra to roll off the assembly line, "Global #1," was auctioned for charity on Jan. 19, 2019, for $2.1 million at the 48th Annual Barrett-Jackson Auction at WestWorld of Scottsdale. All proceeds went to support the American Heart Association and the Bob Woodruff Foundation. "Global #1" is the only VIN that ends in 20201 -- with "2020" representing the year the Supra was reintroduced to the world and "1" marking it as the first vehicle to roll off the production line. The exterior is factory finished with a matte gray exterior, red mirror caps, and matte black wheels. Inside, the Supra is just as unique, with a red interior and carbon-fiber inserts, representing the first of the Launch Edition for the U.S. market. Do you really like this design combo? Only 1,500 units of the Supra Launch Edition will be available, starting at $55,250. The first is taken, of course, but we suspect that you really didn't want to spend $2 million anyway just to be #1. Learn more about the new Supra on the Toyota website here.